(left) Cecilia Cheung, and (right) Lau Ching-Wan and Daichi Harashima in Lost in Time. The Skinny: Probably the best romantic drama out of Hong Kong since who knows when. Derek Yee's subtle drama is solid and involving, and features fine acting from Cecilia Cheung and Lau Ching-Wan. The whole is a little too neatly packaged, but the film is remarkable in its affecting detail and storytelling restraint. One of the year's best films. by Kozo: Director Derek Yee returns after a four-absence with Lost in Time, a remarkably subtle and restrained romantic drama which could mark a major turning point for controversial actress/singer Cecilia Cheung. 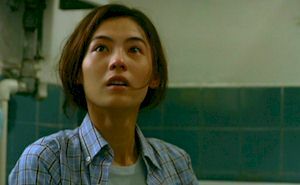 Cheung is Siu Wai, a willful young woman who gets thrown a curve ball when her dashing fiancee Man (Louis Koo) is killed in a two-car collision. Man was a minibus driver, and the bus (numbered 1314) was totaled in the fatal accident. Against her parents' wishesand probably the common sense of mostSiu Wai decides to have the bus repaired, and takes on Man's job as her own. Her reasons are understandable, if not a little unrealistic. The bus was where Man and Siu Wai first met, and also where they apparently conducted the majority of their romance. In keeping the bus around, Siu Wai is also keeping alive the memory of her true departed love. But there's another wrinkle: Man left behind a son, five year-old Lok Lok (Daichi Harashima). Caring for herself and the minibus is tough enough, but with Lok Lok in the picture things are decidedly tougher. Siu Wai stubbornly refuses to compromise, and tries to balance her new life as a minibus driver/single mother. Sadly, it's not as easy as it looks. Being a minibus driver involves lots more than driving around, picking up people and collecting fares. There are blisters, lousy customers, unsavory competitors (the local triads bust Siu Wai for working on their turf), and the local traffic cops to contend with. What's more, bills start piling up, and while Siu-Wai's mother wants to help, the rest of the family is not so forthcoming. Siu-Wai's sister (Elena Kong) browbeats her constantly, asking that she give Lok Lok up, and she's apparently estranged from her father (the great Paul Chun) too. Going at it alone does not look to be an easy option. Luckily there's Dai Fai (Lau Ching-Wan), a former colleague of Man's and seemingly the world's most together guy. Dai Fai was the first person on the scene of Man's accident, and from that small connection, their lives seem to be irrevocably intertwined. When Siu Wai attempts to run her own minibus business, it's Dai Fai who shows her the ropes. He also takes a shine to Lok Lok, and the feeling seems to be mutual. Dai Fai starts making his way slowly into Siu Wai's life, as both a friend and then possibly more. One has to wonder how a guy like Dai Fai would have the patience and free time to spend on a single mother. While not as dreamy as Man was, Dai Fai can clean and cook with the best of them, and is so supportive and giving as to be a near-cartoon. Single mothers out there would pounce on the guy, and Siu Wai eventually sees the opportunity too. The guy seems too good to be true. Which he sort of is, though the film manages to dodge that bullet with surprising dexterity. We eventually do learn just why Dai Fai is such a giving guy, but even before that he seems real, which is probably no surprise since it's Lau Ching-Wan in the role. Long HK's most under-appreciated actor (Will this guy EVER win a Hong Kong Film Award? ), Lau brings the correct balance of restrained concern and hidden emotion to what has typically been a poorly-written stock character. Unlike Liu Ye's similar character in The Floating Landscape, Dai Fai is not obviously enamored with the grieving young woman, nor is known all around the neighborhood as the world's greatest guy. He's simply a human being whose choices are rooted in very believable experiences, and when they come to light, they feel appropriate and not manufactured. There's always a danger that a character like his will turn out to be a plot device, i.e. the "understanding gentleman who helps the grieving widow past her personal tragedy." That's not the case here. But Lau Ching-Wan's acting is no big surprise, given his long and versatile career. If anyone surprises here, it's Cecilia Cheung, who's remarkable as Siu Wai. The character is called upon to be tough, but vulnerable, and Cheung rises to the challenge. Her stubbornness hides weakness and despair, and Cheung manages to show that beneath her lovely face and charmingly rough voice. Her abilities shouldn't be surprising at all; her winning debut in King of Comedy showed an actress with remarkable emotion, and since then she's been lost in too many cheesy comedies (Honesty) or ill-advised "girl" roles (Para Para Sakura). Cheung has always been best when we're asked to feel what she's feeling, and not when she's delivering some three-minute speech on how some guy hurt her, etc., etc., blah blah. Derek Yee wisely lets Cheung's emotions do the talking.